Orange-Fleshed Sweet Potato has enormous health benefits including its ability to help gain weight, boost immunity, ease digestion and treating bronchitis. It also helps in treating arthritis and stomach ulcers. In this post, we give elaborations on the various health benefits of Orange-Fleshed Sweet Potato (OFSP). Of the many varieties of sweet potatoes, Orange Fleshed Sweet Potato is highly rich in beta-carotene, which is an excellent source of Vitamin A. In developing countries where vitamin A deficiency, especially in children, is a big challenge, consumption of orange-fleshed sweet potato is a good solution. Vitamin A helps improve resistance to infectious disease, increases morbidity and prevents dry eyes. It also reduces mortality in pregnant women and lactating mothers and their children. Like other sweet potatoes, Orange-Fleshed Sweet Potato is high in fibre and has a good taste. There is also the presence of magnesium in the OFSP. These properties combined improves digestion a great deal. They are easy to digest since they are mainly starch. Orange-Fleshed Sweet Potato is made up of adequate amounts of complex starch, vitamins and some amount of proteins. So, for people like those who have recently suffered from illness, the abnormally thin, OFSP provides lots of energy for them to gain their weight. Like common potatoes and sweet potatoes, Orange-Fleshed Sweet Potato has anti-inflammatory properties. This is basically due to the presence of beta-carotene, vitamin C and magnesium. They are very effective in curing internal and external inflammations. As mentioned before, Orange-Fleshed Sweet Potato is rich in beta-carotene. Beta-carotene is a major antioxidant and together with phosphorus, iron, Vitamin C and Vitamin B complex and iron are a very good immune booster, preventing your body from a variety of ill conditions. Sweet potatoes generally are capable of warming up the body. This property may be due to their sweetness and other nutrients that impact body temperature. It is also beneficial for people suffering from bronchitis, along with its powerful effect on congestion. The concentration of vitamin C, iron, and other nutrients help to cure bronchitis. Sweet potatoes generally are high in beta-carotene, magnesium, zinc and Vitamin B and so are important in managing arthritis. Use the water after boiling sweet potatoes externally on joints to ease the pain of arthritis. Sweet potatoes generally have a soothing effect on the stomach and the intestines. They contain vitamin B-complex, vitamin C, beta-carotene, potassium, and calcium. These are good in curing stomach ulcers. Moreover, the roughage in the sweet potato helps prevent constipation which may lead to acid formation. When constipation is prevented, there is no acid formation to cause an ulcer. The anti-inflammatory and soothing properties of sweet potatoes also reduce the pain and inflammation of the ulcers. Like sweet potatoes, Orange-Fleshed Sweet Potato is high in fibre which helps the body to retain water. This helps the maintain water balance in your body, keeping the cells functioning efficiently. They say sweet potatoes, generally are not good for people with diabetes. However, they help proper secretion and function of insulin. The insulin helps in effective regulation of blood sugar levels. Notwithstanding, we advise that diabetics should eat them very cautiously. It is suggested that it is a healthier option to take sweet potatoes instead of rice or other carbohydrates. Orange-Fleshed Sweet Potato has enormous health benefits recommended for domestic consumption. 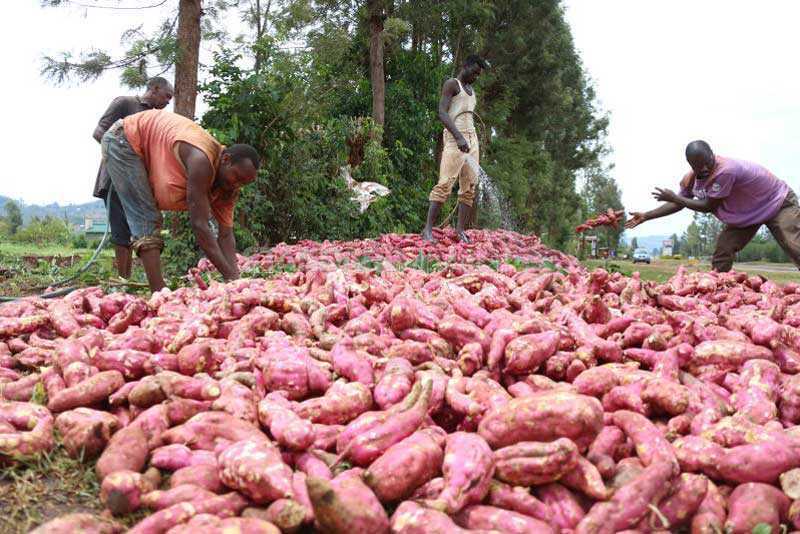 This variety of sweet potatoes is versatile and can really contribute to food security and improvement in health. It's Triple celebration for DP Ruto today! !